For if we have been joined with Him in the likeness of His death, we will certainly also be in the likeness of His resurrection. For if we have become united with him in a death like his, we will certainly also be united with him in a resurrection like his. For if we have become co-planted in the likeness of his death, then we will also be of the resurrection. For, if we have become united with Christ in an act similar to His death [i.e., by being buried in water], we will also be [united with Him] in an act similar to His resurrection from the dead [i.e., our rising from the water to live a new life]. For if we have been united with him in a death like his, we shall certainly also be united with him in a resurrection like his. For if we be graft in death like unto him: even so must we be in the resurrection. 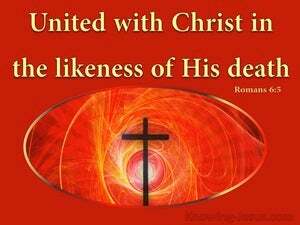 For if we have become united with him in the likeness of his death, so we shall also be united with him in the likeness of his resurrection. 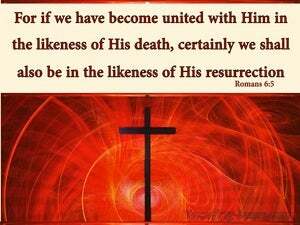 For if we have become united with him in the likeness of his death, we will certainly also be united in the likeness of his resurrection. If we have become united with him by the act symbolic of his death, surely we shall also become united with him by the act symbolic of his resurrection. for if we have been planted together in the resemblance of his death, so shall we be also of his resurrection. And he fenceth it, and casteth out its stones, And planteth it with a choice vine, And buildeth a tower in its midst, And also a wine press hath hewn out in it, And he waiteth for the yielding of grapes, And it yieldeth bad ones! being buried with him in the baptism, in which also ye rose with him through the faith of the working of God, who did raise him out of the dead.